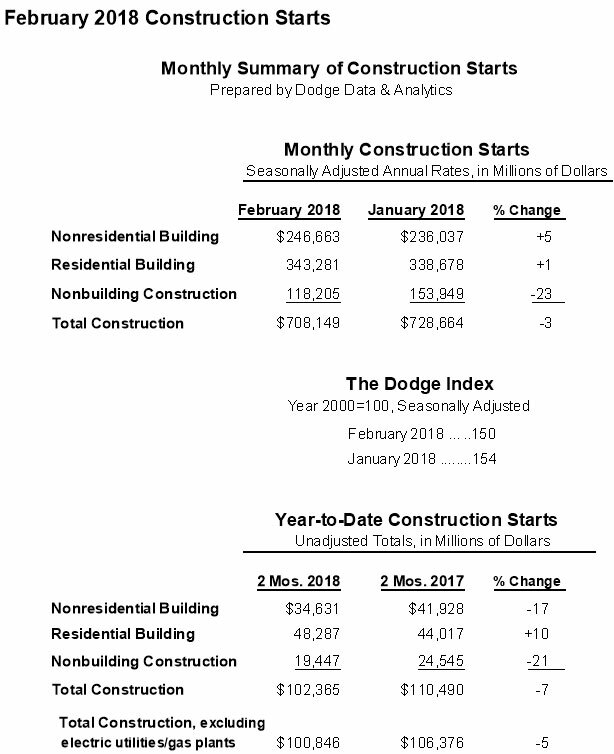 At a seasonally adjusted annual rate of $708.1 billion, new construction starts in February slipped 3% from the previous month, according to Dodge Data & Analytics. The reduced activity in February followed a 2% decline in January, as the early months of 2018 are showing some loss of momentum after the 12% increase reported back in December. The nonbuilding construction sector, comprised of public works and electric utilities/gas plants, fell 23% in February, resulting in the decline for total construction starts for the second month in a row. In contrast, nonresidential building grew 5% in February, continuing the strengthening trend which resumed in December, and residential building improved a slight 1%. During the first two months of 2018, total construction starts on an unadjusted basis were $102.4 billion, down 7% from the same period a year ago which had been lifted by the start of several unusually large projects, including the $3.6 billion Central Terminal replacement project at LaGuardia Airport in New York NY. On a twelve-month moving total basis, total construction starts for the twelve months ending February 2018 were up 2% from the twelve months ending February 2017. Nonbuilding construction in February was $118.2 billion (annual rate), down 23% from January. The electric utility/gas plant category was particularly weak, plunging 83% as the largest project entered as a February start was a $40 million electric substation upgrade in California. In January, the largest electric utility project entered as a construction start was an $872 million natural gas-fired power plant in Louisiana. The public works categories as a group dropped 17% in February, including a 54% plunge for miscellaneous public works which includes such diverse project type as pipelines and mass transit. In January, the miscellaneous public works category had climbed 22%, reflecting the start of the $2.0 billion NEXUS natural gas pipeline in Ohio and Michigan. In February the largest miscellaneous public works project entered as a construction start was a $225 million light rail project in Bellevue WA. The river/harbor development category also experienced a steep decline in February, sliding 36%. On the plus side, highway and bridge construction grew 11% in February, climbing back to within 2% of last year’s average monthly pace after a sluggish January. Large highway and bridge projects entered as February construction starts were the $545 million Gateway Expressway project in the Tampa FL area, the $441 million replacement of the Frederick Douglass Memorial Bridge and Suitland Parkway project in Washington DC, and a $225 million roadway and bridge improvement project in Norristown PA. Sewer construction and water supply construction both rebounded in February, climbing 36% and 10% respectively. Nonresidential building in February was $246.7 billion (annual rate), up 5% from January. The commercial categories as a group rose 14%, with gains across most of the structure types. 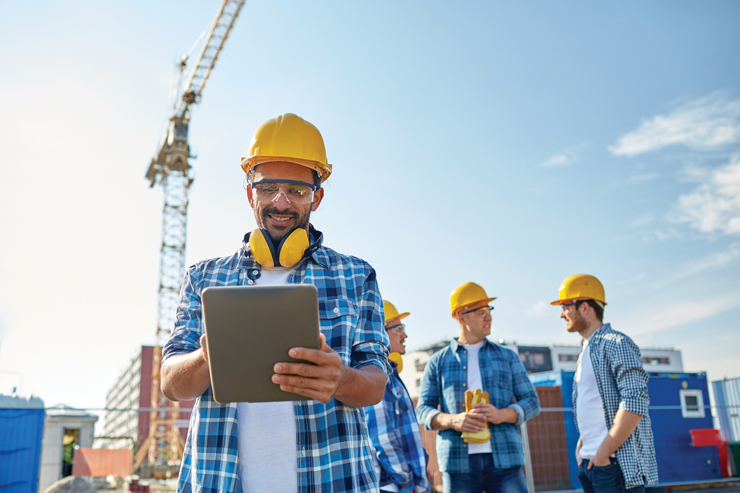 Office construction advanced 24% after a subdued January, boosted by the start of two large data centers – a $600 million Google data center in Clarksville TN and a $183 million Facebook data center in Ft. Worth TX. Other large office projects that reached groundbreaking in February were the $220 million Cerner Corporation Campus in Kansas City MO, the $200 million Turkish consulate office building in New York NY, and the $140 million Stafford Place renovation project in Arlington VA. Hotel construction jumped 60% in February, featuring the start of three noteworthy projects – the $250 million Loew’s Kansas City Convention Hotel in Kansas City MO, the $225 million Grand Hyatt Airport Hotel at San Francisco International Airport, and the $180 million Margaritaville Hotel in New York NY. Commercial garages climbed 42% in February, with the lift coming from a $130 million parking expansion at Midway International Airport in Chicago IL. Store construction registered a 6% gain in February, helped by the start of the $271 million expansion of the Bal Harbour Shops in Bal Harbour FL. 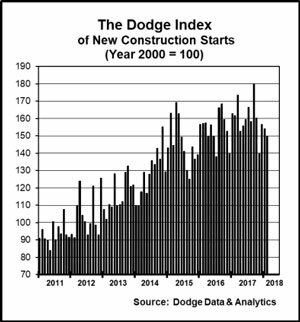 Warehouse construction in February was the one commercial structure type to decline, sliding 36%, although the latest month did include a $100 million Big Lots distribution center in Apple Valley CA. Learn more about Dodge Data & Analytics here.